Maine residents are signing up at fast pace in the final week. 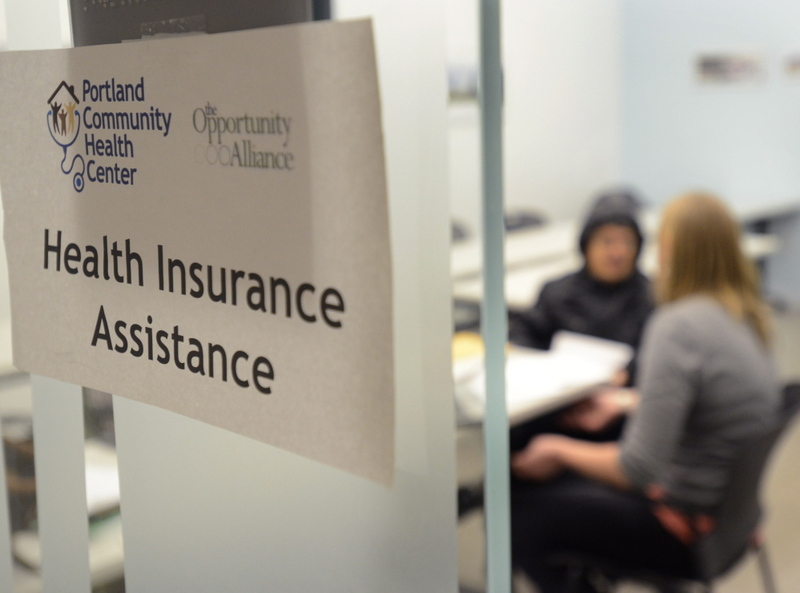 PORTLAND –– As the March 31 deadline to enroll in the Affordable Care Act’s health insurance marketplace draws closer, the federal government is offering a limited two-week extension for people to sign up for health benefits. “We’re saying it’s ‘maybe, kind of, sort of,’ giving an extension,” said Libby Cummings, who assists people with signing up for benefits through the Portland Community Health Center. Cummings was helping people sign up Wednesday during open walk-in hours at the Portland Public Library on Congress Street. While not a blanket extension, those who have already started signing up by March 31 will have another two weeks to finish, according to the U.S. Centers for Medicare and Medicaid Services. The health insurance marketplace is where those who were previously uninsured – often self-employed or part-time workers – can sign up for individual insurance plans, a key component of how the Affordable Care Act reduces the rolls of the uninsured. Meanwhile, survey results released Wednesday by the Maine Health Access Foundation show that Mainers had more problems affording their health care bills than the national average in 2013. The foundation will be conducting the same survey every year to determine how the Affordable Care Act is affecting health care costs. Cummings and other “navigators” – those hired to help people enroll on the marketplace – say it’s been extremely busy and they expect it stay so through March 31. “I’ve had 10 one-hour-long appointments every day, in addition to 40 phone calls every day. There’s only so many hours in a day, but we’re doing what we can,” Cummings said. Emily Brostek, consumer assistance program manager for Augusta-based Consumers for Affordable Health Care, which helps people sign up for benefits, said the help line they’ve set up has seen its call volume triple in recent weeks. Mainers have been enrolling through the marketplace at higher rates than anticipated, according to the federal government. A Kaiser Family Foundation survey released this week revealed that only 39 percent of the uninsured realized that March 31 was the deadline for signing up for health insurance without paying a penalty. Many were unaware there was a deadline or believed it had passed. On Wednesday, Cummings helped Portland resident Tarun Vaswani with his insurance application. As a recent Indian immigrant with a green card allowing him to work, Vaswani is not eligible for MaineCare but should be permitted to purchase low-cost insurance on the marketplace, Cummings said. But because Vaswani’s case is not typical, he was initially rejected, and he will have to appeal. Even if his case is not resolved by March 31, Vaswani can still obtain insurance for 2014 if he wins his appeal. “If they don’t approve it, I will have to wait another year. It’s very frustrating,” said Vaswani, who needs treatments for his left hand, which is mostly unusable because of a birth defect. The survey that asked Mainers if they had trouble affording health care in the previous calendar year was modeled after a national Urban Institute survey. Wendy Wolf, executive director of the Maine Health Access Foundation, which paid $40,000 for the survey, said the foundation not only wanted to see how Maine stacked up nationally, but also if the results could be used to determine whether the Affordable Care Act affects residents’ health care costs. Wolf said the foundation will fund the survey for at least the next three years, and it will be useful to see how the Affordable Care Act affects people’s perceptions of their health care costs. Both insured and the uninsured are surveyed, and in both categories, Mainers felt the sting of health care bills more deeply than the national average. More than one-third of uninsured Mainers and one in four insured residents said they had problems affording their medical bills in 2013, according to the survey. Mitchell Stein, a Cumberland-based independent health policy analyst, said the lack of competition in the health insurance industry; a reduced number of health care providers; Maine’s demographics skewing older; and Maine’s rural landscape drive up the costs of health care. “We live in an expensive state for insurance, so I’m not that surprised,” Stein said. But Stein said that since the law eliminates most high-deductible plans and mandates that insurance companies provide free preventive services, it will be interesting to see how the law affects future health care costs. Another unknown is whether businesses will stop offering employer-based health care benefits. “There’s so much we don’t know, so this survey will give us some important feedback moving forward,” Stein said.